Well who can believe it?!?!? It's only Saturday night and I am posting my entry into this week's Just Add Ink Challenge- a whole four days earlier than I usually do. So much more relaxing this way!!!! The reason being is that my little treasure slept for 3 hours today so I used the "bonus" time to do some creating just for me (not for business) and Waa-Laa here is my "Wild About You" Layout for this week's challenge. Wow what a bright little lot!!! At first I thought "EEK" because they are not colours I often use alone never mind all together. But then I pictured a little Green Galore crocodile and the rest of my "Wild About You" A4 layout followed. It was a bit of a stretch adding Pink Passion to a boy's page but I think it actually fits in just nicely. I had SOOOO much fun putting this together. I have always loved this picture of Elliot eating grass in the park and am so happy that this challenge motivated me to scrapbook it. I only noticed when I had finished my creation that he was wearing his little zebra shoes in this shot - which ties in ever so perfectly with the other zoo animals- fancy that!!!! I hope that everyone else that has a go at this week's JAI challenge has as much fun with this funky colour combo as I did. 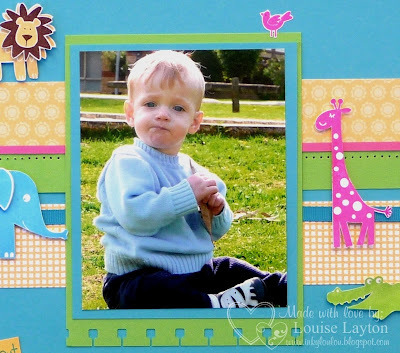 Gorgeous layout, Louise! Such a cute pic of Elliot in the park and the animals pull it all together beautifully! Great job with the challenge colours! This is just such a vibrant and fun scrapbook page. A fantastic entry!! Thanks for being a regular with the Just Add Ink Challenges. Gorgeous! Wild About You works perfectly with these colours, and you've got an awesome layout! Great job! What a gorgeous LO Louise!! Love it, how great are these colours. Well Done! This is so cute. I love the strip elements across the page and the little animal accents are just perfect. Wow such a cheery colourful L/O I love it. Adorable, Louise. Perfectly balanced; and zebra shoes - too cute!